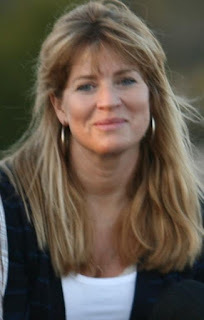 Alexandra Allred is a force of nature. I first met her in Austin, Texas last October, and I was soon in awe of her energy, her passion, and her confidence. 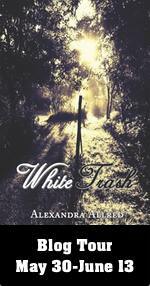 Alexandra is days away from releasing her second novel, White Trash, and she stopped by to talk about it. Later this afternoon, I'll have a review of the book, so stay tuned! Lissa: Your first book, Damaged Goods, also took on an important social cause. What role do you think fiction plays in shaping our culture’s attitude toward social issues? Alexandra: Holy cow! You’re coming right out of the gate, aren’t you? What a great question. The role I think fiction plays in the shaping of our culture’s attitude toward social issues is huge. Huge! Throughout history playwrights have used fiction to ease political and social tension among people, to spur on revolutions and overthrow figureheads. Fiction has always been used evoke that greater emotion with the hopes of creating change. Today is no different. What is different, however, is how we do it. And a lucky thing for me as I’m a wiseass. I like to use the hot buttons in our news for reaction. But let me be clear … I’m not doing it just to be a jerk. I truly hope that by poking fun at ignorance, we can make change. For example, in Damaged Goods, I used raw, sometimes raunchy humor to tackle air quality. If I told you that I wrote a funny book about fighting for clean air, well, let’s be serious. But throw in a drunken emu, a stripper turned Mormon, a woman fascinated with funeral parlors and ridiculous what-if scenarios and now we’re talkin’! It is the same with racism. There are many, many books about how cruel, how unjust, how unfair racism is but to what end? Does it ever stop? When I can depict characters in an unflattering, hilarious manner because they are bigots, the issue is no longer about race but stupidity. Much better. Lissa: What is your earliest memory of encountering racial prejudice? Alexandra: My father was a US Diplomat and we frequently hosted African diplomats. It was in the 70s and my dad had a Col. from Ghana stay with us. I was very little and VERY in love. He was black. I don’t mean mocha or caramel colored but I mean he was almost black and I thought he was the most beautiful man I had ever seen because when he smiled, I never saw such pretty teeth. This poor man … I followed him everywhere and told him all about my stuffed animals and guinea pigs. He would always laugh and call me “Evergreen.” Always happy. He said that I reminded him of his own daughter back home and each time my parents tried to save him from me, he always said to let me be. I reminded him of home. Before he was to leave, we took him to the Grand Canyon. I was so excited. I took his hand to run to the edge but he pulled it back. I still remember him trying to explain to me that he could not hold my hand while we were in public. Not long after, my mother had me watch the movie, The Story of Miss Jane Pittman in hopes of helping me understand. I was devastated. Didn’t they see how pretty he was? I couldn’t understand it. Lissa: In an article you wrote, you spoke about the books you’d written on your Olympic experiences. Were you able to talk about some of the causes that are close to your heart in those books? Alexandra: While I was on the US women’s bobsled team, I was focused on getting women into the Olympic Games. I guess I always have a cause. When I realized that women were not allowed into the sport, I fought for that. Once we got it, I moved on. I am lucky. I’ve never been seriously injured, I have my health, I got an education, and I’ve had adventures. The way I see it, I’d be a big jerk if I went through life pretending like everyone was as fortunate as me. When I was a kid living in Moscow, some Russians rushed by the guards outside the American Embassy. The guards grabbed at whoever they could but five members of the family slipped in. I’d been outside skateboarding when it all went down. We’re fairly certain those who were caught were killed. The five who made it inside honestly believed that we, the Americans, could simply ship them to America for freedom and a new life but we couldn’t. There was no way to get them out of the embassy and so the life they once thought was so restricted got much, much worse. I used to go visit them with and feel so … helpless and sad. Whether you’re writing sports, fiction, whatever, if you can open the eyes of others to elicit help, sympathy or change, why not? If you can make them laugh … bonus! Lissa: I’ve got to ask: where do you get the energy? You’ve lived at least three lives in your short number of years. Did you have this adventurous spirit as a child? Do you see yourself climbing Mt. Everest in your eighties? Alexandra: Ha! It is really good that my mom isn’t allowed to answer this question. I tortured her as a child. I do have great aspirations to be active in my nineties. I train a woman named Ms. Heidi. She’s 92 and always smiling and I think, “That’s gonna be me.” Life is so precious, so amazing, so awesome, why in the heck would I want to be on the sideline? Also, it helps to be super immature. Lissa: What’s the one adventure you wouldn’t want to have? For me, it’s skydiving because I have a horrible fear of heights. Alexandra: Most of my athletic pursuits have been very physical. I’ve done bobsled and skeleton, fought competitively, played women’s professional football, did dog attack training and did other weird/stupid things for adventure writing articles. I don’t really have a fear of anything but I dream a lot about sharks. I want to get in a shark cage with Great Whites in the water but at the same time I don’t. Lissa: Your self-confidence is inspiring. So many young women today struggle with it. You showed us in Austin one of your methods of building confidence. What was something that built your confidence as a young woman? Did you ever struggle with it? Alexandra: Okay, these are seriously deep questions. You’re making me think! Yeah … that was a great time in Austin. I love breaking boards. I walk into a Home Depot and start drooling. Ohhhh, the damage I could do. 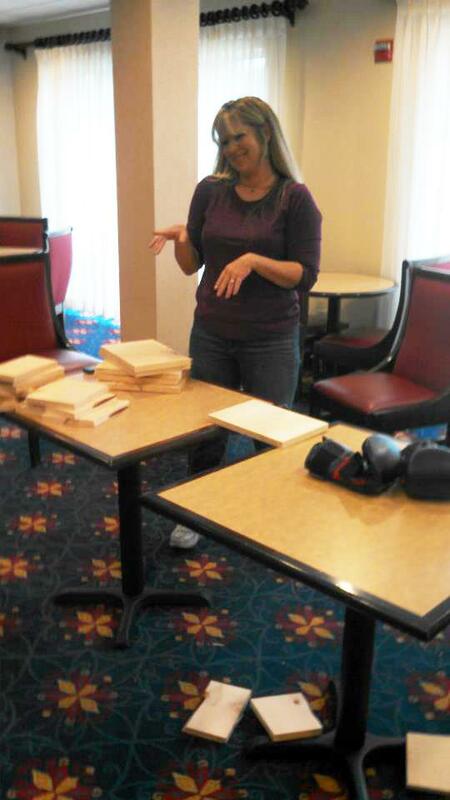 It is so much fun to break boards because it’s 1) easy (really – I swear it is!) and 2) so empowering. When I began martial arts and started to fight and realized I could take care of myself, that was pretty good for the ol’ self-esteem but honestly, I think my confidence grew when I started speaking out for others. As women, we tend to take the lumps and bumps in stride. I do this. But if I’m fighting for someone else – whether for her right to be on a football field, get medical treatment, be married, or be able to breathe, I get aggressive. I know what is right and what is wrong, what is fair and what is unjust. I am my father’s daughter and there are no gray areas here. I also teach at a community college and am always pulling my young women aside and having a special session for them in regards to appearance, clothes, style, mannerism, language and attitude and how it ALL relates to confidence, self-worth and what you can and should expect back. You don’t have to be an athlete or be fighting for a cause to have confidence but you will never have it if you weigh it against how others see you. Blah, blah, blah …I know its cliché but nonetheless true. You ARE what you believe you are. Lissa: Okay, I’ve got to ask about the fainting goats! I laughed until I wept watching videos of them after you introduced me to them. How did you discover them? I decided I could never have one for a pet, because I’d be scaring the poor thing constantly. Have you gotten to meet any of them in person? Did you scare them? Alexandra: I LOVE GOATS! Who would have ever thought I would say something like that?! But when I got Star, my horse, Cookiedough, the goat, came along with. They were best buddies. Cookiedough happened to be pregnant and that was the beginning of my love of goats. Sugar and Spice came along and we had a blast. A friend introduced me to fainting goats and from the moment I saw them I said this one thing over and over and over … “I must have one.” My husband and I have an understanding. 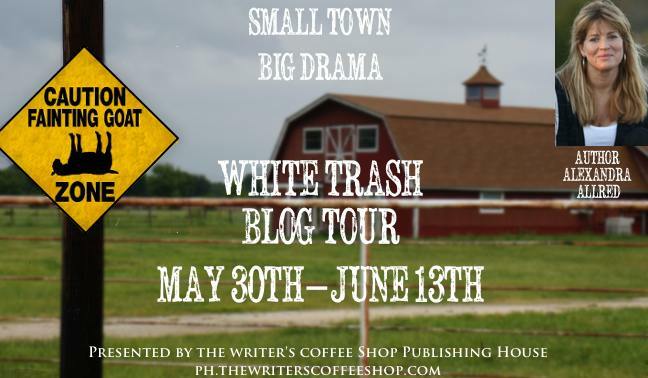 If White Trash becomes a best seller, I WILL have my fainting goats. As for the thrill of running outside with an umbrella every five minutes to scare them … I’ll have to try to control myself. Heh heh heh. Gee, maybe we should include a fainting goat link so others will know the joy of watching goats faint. Lissa: You just got back from an adventure in Sydney, Australia. What was the best thing about the writer’s conference you attended? Did you come away with any practical advice you’d like to share? 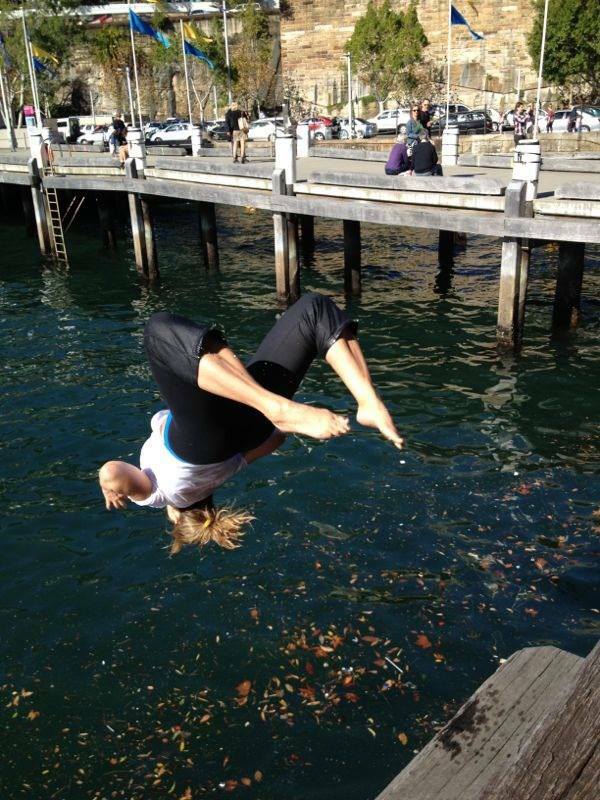 Alexandra: Did you see the picture of my back flipping off the pier into the harbor?? THAT was pretty cool. But, ahhh, I suppose you mean actual learning experience re: writing. Because I write about those things I am passionate about, I am often led in a certain direction. While I was there in Sydney, I was able to meet Bob Brown, a former Australian senator and beloved environmentalist in the country. While this may not sound terribly exciting to anyone else, I was star struck. What an extraordinary human being. I also met with Sen. Christine Milne, the current senator from Tasmania. These meetings were my rewards for writing with passion and truth – reminders to me that I am doing what I was meant to do. 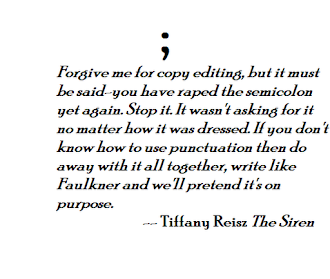 Lissa: What is the best piece of writing advice you’ve ever gotten? What was the worst? Alexandra: Write what you know. It’s so simplistic but it is so true. Write what you know. You can’t go wrong. I don’t know that I have ever gotten bad writing advice but I have been plenty discouraged. I have had moments when I thought, Why am I doing this? This isn’t going anywhere and all that is happening is that I’m getting my hopes up only to be dashed. I should quit. 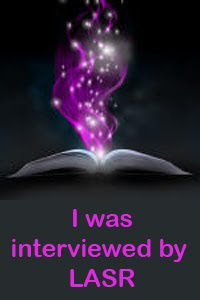 I’m so glad the characters in my head kept talking to me so much that I had to keep writing! They – those funny little voices in my head – make me so happy. Lissa: You’ve won the lottery! After contributing to charities, paying off bills and all that practical stuff is done, you’re going to buy yourself a treat, something that’s pure indulgence, just for you. 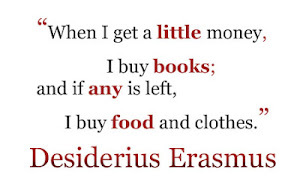 What do you buy? Alexandra: You’re kidding me, right? Fainting goats!!!!!! 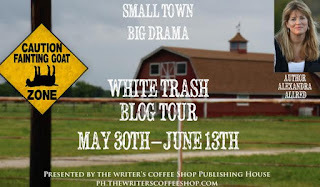 White Trash will be available on Amazon, B&N.com, and Kobo on June 6th. It is currently available for preorder on iTunes and The Writer's Coffee Shop website.